Displaced children and women stand in Aleppo, Syria. The top United Nations humanitarian official today expressed concern about the deteriorating situation in the Syrian city of Aleppo, where hundreds of people have been killed or injured by indiscriminate attacks in recent weeks. “I join UN Secretary-General Ban Ki-moon in strongly condemning the attacks against civilians in Aleppo and in many other parts of Syria,” said Under-Secretary-General for Humanitarian Affairs Valerie Amos. Mr. Ban last week voiced grave concern about the continued and indiscriminate use of heavy weapons and mortar shelling in the ongoing conflict, particularly in hard-hit Aleppo which the Government has targeted with “barrel bombs,” or oil drums filled with explosives and shrapnel and dropped by aircraft. “People have suffered enough,” Ms. Amos said, adding that insecurity continues to have a major impact on efforts to reach people with life-saving assistance. “I remind all parties to the conflict of their obligation under international humanitarian and human rights law, and their responsibility to ensure the protection of civilians,” she said. The Security Council adopted a non-binding presidential statement three months ago in which it underscored that humanitarian organizations operate in a neutral and impartial manner, and need unhindered access to safely reach all people. Over 100,000 people have already been killed in Syria and 8 million driven from their homes, with 2 million of them seeking refuge in neighbouring countries, since the conflict first erupted in March 2011. There is now an average of 127,000 people pouring out of Syria each month, according to the latest figures from the UN High Commissioner for Refugees (UNHCR), which added that the number of registered refugees is expected to surpass 4 million at the end of next year. Across the region, some 400,000 refugees live in formal camps, but nearly 2 million reside outside formal settlements, the UN agency noted. To keep pace with the exodus, more than 196,000 tents and 809,000 plastic tarpaulins were distributed to refugees residing in camps and informal sites. Meanwhile, at least five Palestinians trapped inside the Yarmouk refugee camp in Damascus have reportedly died of malnutrition. The UN Relief and Works Agency for Palestine Refugees (UNRWA) said it has been unable to deliver relief supplies to the besieged camp since September, and reiterated its call on all parties to immediately heed their legal obligations and allow urgent provision of humanitarian assistance there and to other Palestinian refugee camps. 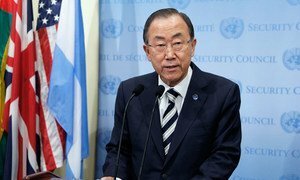 As efforts intensify to bring the Syrian sides to a negotiating table in Switzerland, United Nations Secretary-General Ban Ki-moon today voiced his grave concern about the continued and indiscriminate use of heavy weapons and mortar shelling in the ongoing conflict, most recently in hard-hit Aleppo which has been the site of a “barrel bomb” campaign by Government forces.